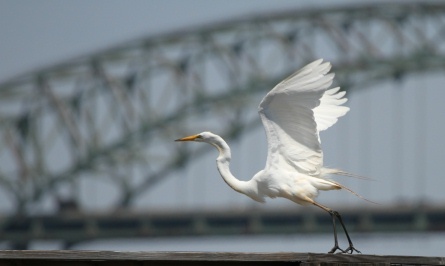 Join the Bayonne Nature Club by coming to a bird walk, meeting or shoreline clean-up. We charge no dues, just come when you can. We look forward to seeing you! Find us on FaceBook at Bayonne Nature Club. That's where we share photos and talk about birds and nature. by Mike Ruscigno in Bayonne, NJ published on "You Tube"
Bird Walk, April 20, 9:00 am at Lefante Walk. Meet at the first green bridge behind Otaiko Restaurant in South Cove Commons Mall. RAIN CANCELS THIS EVENT. THURSDAY Bird Walk: April 25 from 9:00 am to 11:00 am. Meet at the gate of Rutkowski Park near the restrooms of Stephen Gregg Hudson County Park. EARTH DAY: Saturday, April 27, 9:00 am to 11:00 am Shoreline Clean-up - Collins Park. Meet in the parking lot off 1st Street, between Trask and Humphrey Ave. Dress for dirty work. Tools, garbage bags, gloves, snacks and water will be provided. Here is the May, 2019 newsletter! 1. MEETING: Thursday Evening, May 2 at 7:00 pm to 8:30 pm at the Bayonne Public Library on Ave. C and 31st Street, on Second Floor. VIDEO: Reinventing Power. Discussion afterward about wind and solar energy. 2. THURSDAY Bird Walks: May 2, 9, 16, 23 and 30 from 9:00 am to 11:00 am. Meet at the gate of Rutkowski Park near the restrooms of Stephen Gregg Hudson County Park. Bring your binoculars, we’ll bring the scope. 3. 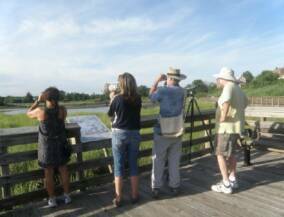 SATURDAY Bird Walks: May 4 and 25 at 9:00 am to 11:00 am at Lefante Walk. Meet at the first green bridge behind Otaiko Restaurant in South Cove Commons Mall. Bring your binoculars, we’ll bring the scope. Spring migration begins. 5. Saturday, May 25, 9:00 am to 11:00 am Shoreline Clean-up at 16th Street boat ramp. Dress for dirty work. Tools, garbage bags, gloves, snacks and water will be provided. We’ll be joining Bayonne’s Earth Day activities by removing plastic trash from the walkway. Be sure to tell your friends! 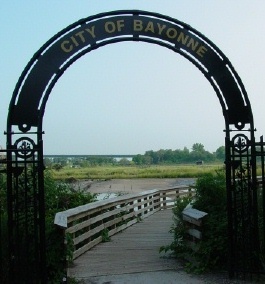 Join the Bayonne Nature Club by coming to a bird walk, meeting or shoreline clean-up or help with the butterfly garden and/or by displaying your photos at the library. Find us on FACEBOOK. We charge no dues. We are nature enthusiasts and activists. Please consider making a donation. We hope to see you soon! Above picture taken by Susan Hill. 7/2012. Click here for our Archive of Clean-ups. We have expenses too: the cost of the web site, the cost of water and snacks for the shoreline clean-up volunteers and the bird feeder campaign. We also purchase nature/science books and donate them to the Public Library. If you have items appropriate for flea markets/rummage sales that you would be willing to give up, we will pick them up and sell them and keep the proceeds as a donation. Please click on the contact button below, tell us what you have. Sorry! We are not a 501(c)3. This King Rail and chick was seen in Bayonne NJ, July 26, 2014 from Lefante Walk. This Clapper Rail was seen in Bayonne NJ, August, 2012. A Marsh Wren is singing in the tall grass out of sight. This Yellow-crowned Night Heron was seen in Bayonne NJ June, 2013. Video by Michael Ruscigno. The first Bald Eagle seen in Hudson County, NJ in over 50 years. Eagle populations are increasing in NJ as the rivers become cleaner. This is why we fight for cleaner rivers. Video taken on Feb. 25, 2015 by Mike Ruscigno. These male Wood Ducks were seen competing with each other March 10, 2016 off Lefante Walk in Bayonne NJ. A Clapper Rail builds a nest June 7, 2016. Mike Ruscigno took this video from Lefante Walk, Bayonne NJ. This video confirms that Oyster Catchers were seen at the Cove of Liberty State Park. Better yet, the immature seen in this video confirms that there was a successful nesting. Video taken by Mike Ruscigno. A Merlin (falcon) devours a Mockingbird from high up in a tree. Video taken Oct. 7, 2016 at Lincoln Park in Jersey City, NJ. Video by Mike Ruscigno. To see more pictures taken by our Bayonne Nature Club members, Follow us on FACEBOOK. September 29, 2017 Mike Ruscigno discovers the first American Bittern anyone has recorded off Lefante Walkway, South Cove Commons mall. These birds are very secretive and Mike took this video early in the morning as the sun rose and the tide went down. A Snowy Owl visits the roof top of a house in Bayonne NJ. We named her Eve because she came to roost in our town on Christmas Eve. See the video by Mike Ruscigno left. See video at left of Harbor Seals in NY Harbor seen from Bayonne Golf Course Walkway/Lefante Walk. Video at left: It is called a Rail, but is it a Clapper Rail or a King Rail? Seen off the big green bridge of Lefante Way, South Cove Commons Mall, Bayonne NJ. Spring 2018. At left, Tricolor Heron and Great Egrets seen at Liberty State Park. Video by Mike Ruscigno. August 17, 2018, Mike saw an adult Clapper Rail and chick playing in the pond below the big green bridge on Lefante Walk, South Cove Commons Mall, Bayonne Golf Course Walkway. Proof once again that clapper rails are nesting in the wildlife area along the walkway.